Designed to be a robust and reliable system with low maintenance. Up to 8 operators can each use the system simultaneously. The Skaginn 3X Cleaning System is designed to be reliable and user-friendly system with centralized cleaning stations. The unique features of the cleaning system are a centralized water, soap and disinfection system built as a single compact system, controlled by PLC computer. The system can be delivered with both low and high pressure pumps within the same cleaning system. The system allows up to 8 persons to use the system simultaneously. The main feature of the low pressure cleaning system is that it uses low water pressure (12 - 20 bar) and high water volume (70 l/min). The low pressure cleaning system is used to flush and remove dirt and bacteria in the food industry and is suitable for cleaning delicate equipment. The high volume of water removes and flushes the dirt off the surface and the low water pressure is essential to produce less aerosols settling down on walls and floors. The low pressure cleaning system is used for daily cleaning and is necessary before further cleaning and disinfection. The main feature of the high pressure cleaning system is that it uses high water pressure (70-120 bar) and low water volume (15 l/min). The high pressure cleaning system is used to remove all dirt from the processing equipment, walls and floors and removes difficult stains. The high pressure cleaning system is available with various lengths of lances. It has a built-in soap and disinfection system in a special satellite which is easily activated. After the area has been cleaned with low pressure flushing and is ready for soaping, the soap system is activated in the satellite and the foam lane is coupled to the hose. After soaping, the soap is rinsed with the high pressure system and finally, the disinfection system is activated in the satellite. The high pressure and low pressure pump stations need to be housed in a dry, heated room. Containers for soap and disinfection materials must be situated on the floor above the processing floor. The simplicity of the unique satellite system is thanks to its low maintenance, wall mounted distribution controls. 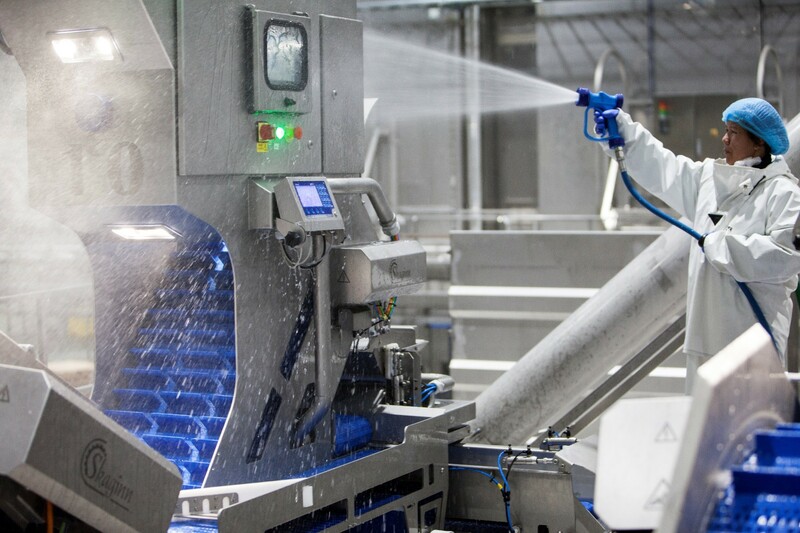 The satellite controls distribution of the complex soap and disinfection supply in the processing area. The high pressure pump powers the distribution of soap and disinfection through the Skaginn 3X satellite system. The cleaning system is ideal for cleaning all fields in the food industry and in other industries. The system can be installed in both onboard and onshore facilities.